This is one of the best fireworks displays on the Peninsula. You can get a good close view of the action, freeway access is excellent and parking is usually bearable (note: but get there early to be sure). Here’s a map to $10 special events parking. However, it is quite crowded as you would expect. Some families start “reserving” picnic spots on the lawn in the early afternoon though standing room is still available around the lagoon. Many locals boat in from their homes on the canals. While waiting for the evening fireworks they attend the Fourth of July Festival held all day from 9 am – 9:45 pm. 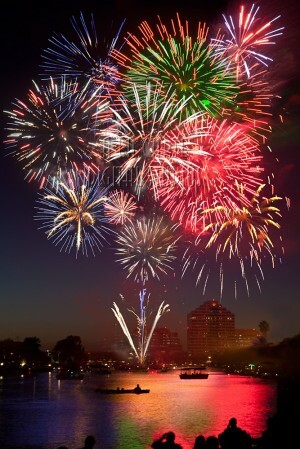 On July 4th the fireworks explode from 9:30 pm – 9:45 pm over the Lagoon at Leo Ryan Park, 650 Shell Blvd/Hillsdale, Foster City. Admission is FREE but there is a $10 fee for special events parking nearby. Be forewarned – parking is very difficult and you must get there early.